Fast forward to Christmas 2009 when Santa left a copy of J.S. 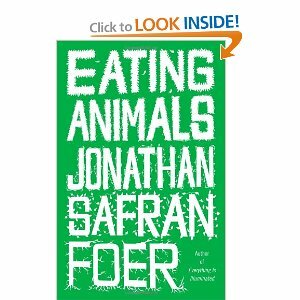 Foer’s EATING ANIMALS under our Christmas tree in Ajman. i read it over 3 weeks. It then took Kim more than 3 months to read. She’d read a page or a paragraph and have to put it down. While she was reading it we discussed our diet and about the idea of changing it. At the same time, January 2010 we became members of PETA and watched the kentuckyfriedcruelty.com video on the horrors of being a Kentucky Fried frier. Prior to viewing that video i’d buy KFC once a year when travelling. Quick and convenient but, now i know unspeakably cruel. So a year ago i determined i would never darken the doors of a KFC again. Once Kim had finished reading Foer’s book we decided to become vegetarian. Becoming vegan isn’t an option as Kim’s lupus means she does need some forms of animal protein so we still eat eggs and dairy products. The transition was fairly smooth; we didn’t eat all that much meat anyway in the normal course of a week. Once the decision was reached we just stopped buying meat and slowly emptied our freezer. Going back to Kuching for the summer was interesting. Our new diet causing a bit of a stir amongst our friends who wondered what they could serve us for meals when they invited us over. And Kim’s dad’s idea of vegetarian cooking did not preclude sneaking in minced pork or prawns… We actually managed to order a totally vegetarian meal at the Sarawak Club when we hosted a meal for friends and family. Took a parley with the chef but it was successful and even Kim’s mum said it was OK. We also discovered a delightful vegetarian stall in one of Kuching’s food courts that serves up vegie versions of all the trad hawker food treats like quay teow and laksa so we were in vegie heaven. do i miss eating meat? Yes and no. Christmas minus the turkey was novel but then so were the pumpkin and mushroom in sage potpies that we served up as the alternative. They were scrumptious. i guess i miss not cooking the traditional Quebecois fare of Tortiere and Cretons also but i can live without them, no problem. Both Kim and i have lost weight so there is also that bonus.